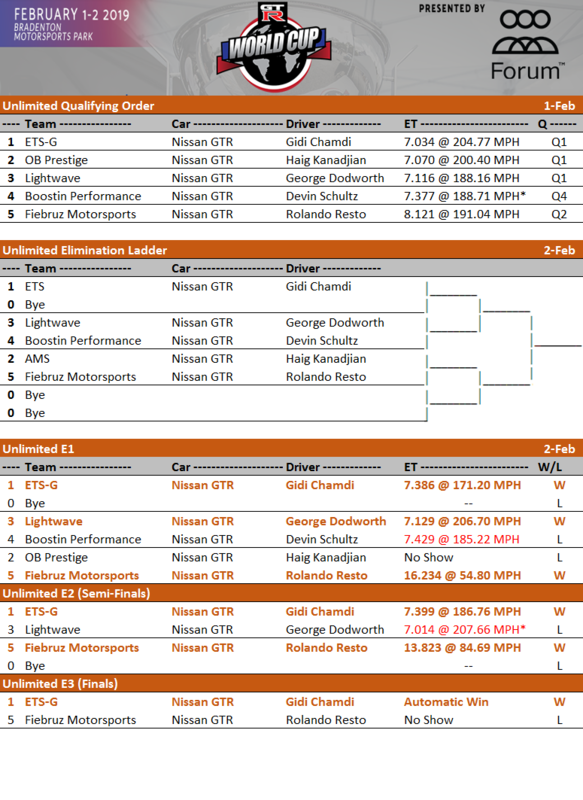 HomeNEWSGidi Chamdi Dominates at the GTR World Cup!!! It’s the one event GT-R enthusiasts wait for all year long; racers and fans alike. It’s the GT-R World Cup!!! Celebrated at Bradenton Motorsports Park for the 1st time, the 3rd Annual GT-R World Cup brought the best of the best GT-R teams from all across the nation! All the way from Puerto Rico, Fiebruz Motorsports sent their 7 second GT-R (via next day air delivery!!!) to compete in the Unlimited Class. During Thursday testings, with Roly Resto onboard, the Fiebruz GT-R went 7.63@199 MPH!! Two-time GT-R World Cup Champion, Gidi Chamdi, came to this event determined to defend his title. Now under the Team ETS umbrella, Gidi debuted a new look, and right away started where he left off from previous years, qualifying in the #1 position with a 7.03 at over 204 MPH! The Unlimited Class has no power adder limits. The only rules are that the car needs to be stock chassis and GR6-transmission powered. Fiebruz Motorsports and the newly debuted ETS-G made it all the way to the finals, but unfortunately Fiebruz encountered mechanical failures and were a no show in the Finals. Gidi went on a bye run to win the class yet again, becoming the first three-time Unlimited Class GT-R World Cup Champion, laying down an event best 6.94 @ 196 MPH. The Outlaw Class is limited to a 76mm turbo size. Jordan Martin took the win with a 7.11 @ 203 MPH and ran a personal best 7.06 @ 206 MPH during the event. The Pro Street class is limited to 68mm turbo size and 151.99 1/8-mile MPH cap. John Shepherd took the win in Pro Street with a 7.74 @ 182 MPH. In the Modified Class Pascal Legault took the win with a 7.73 @ 181 MPH.